Living Faithfully with Autoimmune Disease | Welcome to my page! This site is for everyone. My name is Tabitha. I have over ten Autoimmune Diseases and I still have a pretty good attitude about my life. In fact, I even consider myself blessed. I write because there are real people out there that are going through the same very real things that I am going through. I pray that I can encourage and bring hope to my readers. 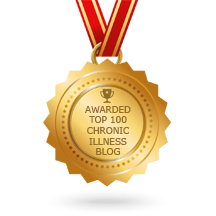 Top 100 Chronic Illness Blogs. Feedspot have put me in their list of ‘Top 100 Chronic Illness Blogs’ – I am quite honored to have been chosen as there are so many great bloggers out there on the web. Thank you to my amazing readers! Thank you Feedspot! God is so amazingly good to me! Gratitude √…What are you grateful for? Admittedly I have been a little down for a few days but I find the best way to bring myself up is to start thinking about what I am thankful for. Basically, I count my blessings. Today I am thankful that I do have a wonderful family that loves me. I am thankful for the beautiful spring day today, and I am thankful that Jesus loves me. Gainesville, Florida, the swamp, home of the Gators, my hometown for my entire life. Gainesville is a small college town made up of even smaller towns in the surrounding areas located in the country. Trenton, Florida is my backyard. I hope that together we can unite and pray for this small community, the officer’s family, and for our continued prays for our country. How strong is your trust in God? I am trying something new and creative with my blog today. I took some time out to make a Video Blog. Please let me know what you think, I am eager to get some feedback on the message and the idea of the video blog. God does not make us feel guilty. Since I have been diagnosed with Lupus I seem to always have this battle inside of my own mind with not being able to be who I once was. I have a hard time accepting the transition of who I was to who I am now. I fight not being able to go and do all that I want, with all that I have in me, and it’s an exhausting fight. Often times I end up hurting myself because I still have a lot of things that I want to do but there are more things that I can’t do. I have an ongoing battle in my mind and I often feel like I am not the person I was anymore. I feel guilty when I miss out on things. I feel guilty when I have to say I can’t go or I can’t do what people want me to do. There are a lot of days that I feel as if I have lost who I am and I feel guilty because it’s not fair to my family and friends. I feel guilty that my family and my friends watch me suffer. If I had to take all my health issues and list out how each one affects me, I would say the most difficult one to handle is the emotions and guilt with being sick would be at the top of my list, I feel guilty for being sick and my illnesses drain my emotions. No one really talks about it much but for me the guilt is devastating. A lot of people talk about slipping into depression and that is a huge subject for another day, but today I want to bring awareness to the fact there is a feeling of guilt in chronic illness and it is normal, I can only say how I feel about the guilt that I have but I am betting a lot of people with chronic illness has this as well. Over the last few years, I have had to slowly succumb to the things I should not do. In some cases, it’s not the things that I cannot do but the things that I can do but if I do those things I suffer immensely. I can’t do things like I want to and like people want me to. It’s changed my entire life, and often I feel guilty for not being able to help, or volunteer, or just being able to jump in. I miss that part of my life. However, I have to remember that guilt is not from God, it is the trick of the enemy. God never makes us feel guilty, God doesn’t work that way. When we feel guilty it is an emotion that makes us feel inadequate, sub-par, and below average; God has nothing to do with that, that is the enemy trying to bring us down so that we will give up. God draws us to Him out of love and compassion, it is our own insufficiencies that bring us to the point that we feel like we do not measure up to God’s standards and expectations. I have learned to surround myself with Godly people who bring me back to where I need to be in order to fight this fight. I have also learned that I can not fight this fight alone. I have accountability, and I put it all down for Jesus to deal with. It’s ok to change your standards to brand new standards. God is always moving but it is easy to get caught up in the moment when hard times come, maybe you feel like you are in a dark hole screaming to the top of your lungs and nobody is hearing you. I know I have felt like this a time or two in the last four years at least. Things happen that are beyond our control, and we put our faith in God just like we should. We pray and we pray and as far as we can tell, nothing is changing, then we begin to think that God isn’t moving. That is just enough for the enemy to creep in with his lies and fill our minds with doubt. God is always moving even when we do not see it!!! We just want to see a flashing neon sign saying, GOD is MOVING NOW!! Blessings are often considered too late or not enough. Maybe the miracles of God are exactly within that statement because God’s timing is perfect. He knows our needs and exactly how much we need. His ways are not our ways!! God is God, he is all-powerful, all-knowing, all loving, and his love never fails. Today, Praise God even if you are in the middle of a storm. He’s got this! He is moving! God gives me power and authority. Suffering doesn’t always have to mean hopeless. When you are suffering it’s easy to slip into a state of hopelessness. I live with chronic illness, my major organs are being attacked one of them is my heart, that means unless God heals me, I am not going to get any better. That also means, each day I have to be at peace with where I am at today, at this very moment. You can be angry about the past or your present right now, that’s entirely up to you. I tend not to give the power back over to the people or my illness that have already ruined things once. Two; I can use my circumstances and become stronger because of them. Every time life knocks me down, I get back up again using it as a spring-board. I focus on the good things in life and enjoy every moment in life that I do have. I choose to live my life exactly like the second choice. I have no time for negativity in my mind because my time is so precious and limited. I refuse to allow myself to think about how unfair my illness is. I know the consequences in the end, but I do not dwell on them. I am making my life worthwhile anyway though, no matter the trials. Make your life count for something no matter what is going on in your life. If you are sick, count your blessings still. I would rather live out the rest of my days being grateful for all the things I do have, rather than be upset, live in regret, waste precious time, for the things I didn’t do or don’t have. How to find the”perfect”, church? My view from the pew. It’s Sunday morning and we have a choice to make. Do we get up and get the kids and ourselves ready for church or do we lay in bed, maybe sleep in, or watch some TV church for a few minutes until we get bored and turn the channel to Food Network? There is a brand-new trend that I have been hearing about lately, it’s called “stay at home Christians.” What does that mean anyway? I have also heard, “I don’t have to go to church to be a Christian.” Let me set this straight, no, we don’t have to go to church to be a Christian, but we live in a free country where we have the right to go to any church we choose to attend, not everyone gets that choice. All over the world, especially in communistic countries, people do not get the choice of what church they want to go to attend. Here are some reasons why people are not going to church. I did a little research and this is what I found. 1. Churches are always asking for money. *It’s your choice to give or not to give. God is the one that requires tithes and offerings, take it up with Him. 2. Sunday’s are my only days to sleep in. *A lot of churches have Saturday night services as well as Sunday morning and afternoon services. 3. I don’t get anything out of it. *It is up to the individual what they get out of church. Some people go for the music, some people go for the message and still others go for the fellowship. Honestly what we get out of church is what we put into church. If we will worship during the music, we will be blessed. If we will apply the message to our own life, we will be filled. If we are friendly, we will gain friends. There are also some reasons that I believe that we should go to church. Let me give my top three reasons for going to church. “And they devoted themselves to the apostles’ teaching and the fellowship, to the breaking of bread and the prayers.43 And awe came upon every soul, and many wonders and signs were being done through the apostles. 2. We are a body of Christ. We should worship together, encourage one another, learn God’s word together, pray for one another and strengthen one another. 3. When we have a church home we have a church covering. That means that we are covered in prayer by other Christians at all times. I understand that we can pray for ourself, that is great, but wouldn’t it be better to be covered in prayer by the pastor and the prayer warriors at a local church that loved us, and knew us. When we are not under a covering, we choose to fight the enemy alone. Wouldn’t we rather have an army with you fighting then fighting on our own. How do I find the perfect church for me? The truth is, there is not a perfect church. We are all sinners saved by grace, gathered together in our Fathers house under one roof however there is a church that we can belong to and we can grow in. Finding a church that believes the way you do can be difficult, but it is not impossible. The excuses run wild with why people can’t find the perfect church these days. The millennial’s, for the most part, are looking for great music and a modern service. The older generation typically likes the traditional style of church services. It’s no wonder people have a challenging time finding a church that fits them, but many of the larger churches offer both styles of services at different times. We are in a state of transition as the body of Christ right now and attendance is at a staggering all-time low. Almost ten years ago, there was always something wrong with all the churches that my husband and I visited; the church was too small, they used chairs, I liked pews, the music was not moving, the Pastor didn’t move the earth and sky with his sermon. When we had enough excuses, we would move on to another church. We walked into every church expecting to “fit,” in somewhere and that was never going to work. Things began to change, oh sure, you could find us on the same pew every Sunday unless we really didn’t feel like going. We didn’t speak to anybody, we didn’t move when it was time for meet and greet. As far as we were concerned we went to church because it was the right thing to do. We came in to church, sat down, enjoyed the worship, enjoyed the sermon and at the end of service we went straight home, with no real communication. It wasn’t until I met, what was soon to be, my Spiritual Father who made me get up off that pew and become sociable. I started helping with small jobs. I became a greeter on Sunday mornings and if I wasn’t greeting, I walked around and “tried” to carry on conversations with people. I taught children’s church occasionally. I volunteered for church events. I stayed after church and helped clean up. All of these things added up to molding myself into a church family. I had to learn to make myself mold into the church and create a place for myself instead of trying to make the church fit to me. The trick is, you must get up off that pew and move!!! Move around the church, sit in a different spot. God may have a special person that needs to connect with you. The excuses for not being able to find a good church are just silly. Pick a church that you agree with what they believe, then go, and mold yourself into that family! Be a part of the kingdom of God and grow. As for me and my family, we continue to mold ourselves into our church family and be disciples for Christ. Fear is something that we will all experience in our lives, but fear is actually an emotion that we can control. Fear is an emotion that brings on a reaction of fight or flight. Fear can manifests itself in all areas of our lives. When fear comes, we generally choose one of two pathways; we either stand and battle out whatever is causing the fear, or we run away from the fearful situation. Fear is the most powerful weapon that the enemy can use against us. Living in fear can absolutely can kill, steal, and destroy. Isn’t this the scheme of Satan? As I am watching the latest on the school shooting here in my home state of Florida, many thoughts are running through my mind. I wonder how many parents are thinking they need to homeschool their children. I wonder how my daughter and son would react in the same situation if it happened in their schools. Would they give in to fear, would they be able to react in time and overcome their fear to survive? How many teachers are thinking they need to resign? Last night one of the schools in a nearby small town cancelled school today because of a potential threat. This morning, I watched my kids walk out the door for school, and worry did run through my mind, but I also know that I cannot give into fear. I lived in fear for many years of my life as a result of an abusive childhood. It took a long time for me to learn how to control my fear but once I did my life changed dramatically. First, I had to accept that there are some things in life that I am not going to be able to control. I have to live my life, and stop merely existing. Fear can paralyze even the strongest of person, and the grip is so tight it’s almost impossible to get out of its hold. Fear would give me overwhelming anxiety and take over all of my senses. Understand that fear is a product of the evil in this world and that evil uses fear to control. Once you allowed fear to enter into your mind you are already suffering. There are a lot of things going on in the world right now and we can choose to be afraid, to send our kids to school and or we can teach them to speak up when they see questionable Snapchats, texts, or whatever. We can equip our children to live in their generation without being afraid. Our kids will emulate our actions and reactions so we need to learn how to deal with fear first and foremost. One of the ways that I battle fear is to control my mind and it’s thought processes. Satan can do a lot of things but he cannot control your thoughts. The mind can occupy just one single thought at a time. So, in order to keep fear at bay, I have learned the key point to getting out of the emotion of fear is to stay positive. I have learned to make positive statements to myself almost repetitively. I have found that when I think on the positive aspects of my life or the positive things around me, my conscious mind eventually accepts my subconscious mind. I have learned to make positive statements to myself almost repetitively. I have found that when I think on the positive aspects of my life or the positive things around me, my conscious mind eventually accepts my subconscious mind. One other thing I hold on to keep me calm is reading my favorite passages in the Bible. The Bible holds a wealth of comforting words to keep me calm and serein, so, often I go to the Bible to read passages that hold fearful situations back. Fear is the opposite of faith, and as long as I have God in my life I trust in His plan for me and my family. The Bible says, “For God has not given us a spirit of fear…” (2 Timothy 1: 7a NKJV) Because I know that fear is not of God, I choose to not let fear control me. Satan would have me to doubt and fear, God would have me to trust Him and live a happy fulfilled life despite what terrible things happen to me and around me. God didn’t give us the Spirit of fear. We can’t control what is going on in the world, but we can control our emotions and how we allow fear to play a part in our lives. Day 4..How does Autoimmune affect our family. My husband hangs in there. Working two jobs and helping me to do day to day things. We have two kids and even that is a challenge for me at times, he has to pick up a lot of the slack. My health has declined over the last four years and yet he is still here. Out of anybody my illness affects him the most. This is what he had to say. Before Tabitha was diagnosed with LUPUS, we both worked and were able to provide our kids with most of their needs on a daily basis. Then on that day in April of 2014 when we went to the ER and received the diagnosis that she had a DVT on her right thigh, things started to get turned end over end. Within a few days we were told that she had antiphospholipid syndrome and LUPUS. It seemed that every time we went to a doctor we were told that she had another problem. She lost her job and we were starting to wonder what we would do. I got a second job and we were blessed with me having two employers who are flexible enough that I can be at her doctor’s appointments to support her and help her. It has been a major adjustment for all of us in the last four years. I spend a lot of my time at work worrying about her and trying to coordinate all of her appointments with my work calendar and trying to keep enough leave time to make sure I can get her to them. I try to do everything I can to help her get through each day. I help in setting up her meds for her and making sure she gets them every day. I try to put her needs before mine because she needs help with a lot of day to day activities. I believe we will find something one day that will improve her quality of life to a level that she will not be in so much pain and able to function better, but until then I will continue to do what I can to help her. She deserves that from me and I want to give it to her. Previous post includes a letter from my Dad, my daughter, and my best friend. Day 3…How does Auto immune affect our family. This is my best friend and her perspective. When you have chronic illness, it’s hard to keep friends close because you constantly have to cancel plans and she does get that from me. I have tried my best to educate everyone in my life what Lupus is. I believe that has helped my relationships. the little sleep I have had, working over 12 hours a day, going out 10 days straight. I Love you Tabitha. See previous post for letters from other family. Let me let you in on the seriousness of my Autoimmune Disease story. Let’s get real for a minute. I think at times I downplay the seriousness of my autoimmune diseases and I don’t allow others in on the reality of my story. My major organs are being attacked. I have heart blockages in my right bundle branch and I have the beginnings of kidney issues due to lupus. My digestive system doesn’t work as at it should, for my digestive system to break down foods it takes three times as long as a normal system. I have over ten autoimmune diseases all of them have symptoms of their own. Lupus, Mixed Connective Tissue Disease, Lupus Nuephritis, Gastroparesis Nuerocardiogenic syncope,Sjogens, Autonomic dysfuction, Esophageal dysfuction, Arthritis, Antiphospholipid Syndrome, Autoimmune dysautonomia, Raynaud’s phenomenon, Myositis, chronic pain syndrome, and fibromyalgia. I am sure I have forgotten to list something because I also suffer from short term memory loss. I have to take a hand full of medication in the morning and at night, where before I became sick getting me to take Tylenol was difficult. I am on a healthy eating plan because I have serious digestive issues. I eat soft foods, I do not eat much more than a cup full of food at a meal. I do not eat sugar, processed foods, fried foods, gluten or bread. I have people advising me continuously about special diets, gluten free diets, vitamin rich diets and more as if these would cure things in an instant. I have a list of foods that my doctors tell me I cannot eat but I continue to fight every single day to stay alive and to stay healthy. I just turned 39 years old on Friday and I plan on spreading awareness of the horrible autoimmune diseases that attack millions of people so that one day there might be a cure. My desire is to make the public aware of autoimmune disease and to reach as many people as I can for Jesus Christ. God has given me peace about what is happening in my body and I want everyone else to find peace as well. I remain positive because the only one that can heal me is God. He is all I have. Day 2…How does Autoimmune Disease affect our family? A note from my 14 year old daughter. thinking I may come home to something bad happening. had to think about what hope actually was. When I searched what “hope” meant it said, “a feeling of trust”. I learned to trust God with my mom. Every now and then I still think, “Is my mom going to be okay?”, but I still say I need to trust God. Fear of family and friends leaving when you have Autoimmune Disease. Why me? I have struggled with this question a lot throughout my life. Why did I have to have the parents that I had, abusive in every since of the word? Why did I have to have the dysfunctional family that I grew up with? Why did I have to spend a good portion of my childhood in foster care. Why did I have to get sick? Why did I have to lose my job? Why can’t I go and do as I please like so many other people do in this world? WHY, WHY, WHY? Life is not always fair but I do believe that everything happens for a reason and God always has a plan, even if I don’t see it. I know He did not cause me to have the past that I have and He did not make me sick; that is just a product of living in a fallen world. So, where does God fit in the grander scheme of life? He is my source, my rescuer, my comforter, my healer. God heals in many ways, that is something that I have come to realize. Not so long ago, I had been going through a particularly tough day and I had come to my breaking point when I asked God one last time, WHY ME? It felt like an avalanche was coming down on me since I had found out that I was sick with Lupus. It was one thing after the other and the bad news wasn’t letting up. I was tired of the unfairness of life in itself. That day, I asked God, why me? I didn’t expect the answer that I got back. Why Not YOU? I had been so wrapped up in the unfairness of life, that I had forgotten that God can use every situation in my life to show His power. Although, I cannot equate everyone’s situation and illnesses to mine, I can say for me that God’s grace is sufficient for my needs. When I am faced with the why me, I will stop and ask Why not me? How far would I be willing to go, to share Jesus with others? I could choose to stay in the why me or I could move forward and be in the why not me? I am not signing up to be sick, but since these things are a part of my life, I am willing to use my weaknesses as a testimony to share with the world, my Heavenly Father’s Love, grace and mercy. I am willing to be open and real about my life experiences and share as I go through this journey with others. I am far from perfect, I stumble and I fall just like everyone else, but at the end of the day I remember that I have a Savior no matter what I am facing. Every day is a huge cross to bear for me, but I can either ask why me or I can take up my cross and follow HIM. And that is the song I will sing until I go to meet my Father in a perfect place, where there is no sickness or dying. His grace is sufficient for me, for His power is made perfect in my weakness. What is autoimmune disease to me? What is autoimmune disease? The medical definition is as follows; An illness that occurs when the body tissues are attacked by its own immune system. However, I have my own thoughts on what autoimmune disease means to me. For me it’s not knowing what comes next. My good days are a normal person’s worst day. It’s the daily renewing of my mind to fight against depression, aggravation, and anger. It’s a daily awareness of how I feel, things I do, and how much I do. It’s a daily fight for my life. Chronic illness is more than just a disease that makes my body hurt and an illness that won’t ever go away. It’s mentally draining, it attacks me to my core. Some of my biggest fears in life have had to be confronted in order to survive this illness. There isn’t room for wasting precious energy on things that I can’t control. Facing a chronic illness is not easy, it’s scary and full of unknowns and unanswered questions. It can be lonely at times, even if you do have a full circle of supporters. I often see that other people say that no one understands them, and that is right! No one can possibly understand what you are going through except for yourself. It is your journey. However, we can’t get caught up in how much others do or do not understand what we are going through when we really can’t fully understand it ourselves. If you are a caretaker of someone with Autoimmune disease, the biggest gift you can give to your loved one is to say I believe you and listen. Understand that this illness is beyond what you can see, physically and psychologically. If you are one of my fellow spoonies, find a support system of others that you can gather information from and that can relate. If you need a support buddy, message me! What is autoimmune disease to you? I used to be afraid of everything, so much that my mentor called me “Much Afraid.” After a lifetime of horrible things that I could not control, it’s no wonder that I was afraid of things that I could not control as I became an adult. I worried constantly about things that were completely out of my control. I lived inside of an irrational fear, that created anxiety inside of me; to live inside of my head was torture. I was constantly afraid of losing people who I invested in, I doubted others love for me, I was afraid of every what if you could imagine. Anxiety seemed to always linger around and when real life things would come, I couldn’t control it. It kept me from moving forward and growing for a long while. I worked really hard to change my mindset and come out of that stronghold, and thank God I did because I do not think I could handle all of my illnesses now with that state of mind back then. I think it’s ok to feel afraid and even have anxiety as long as it’s not controlling your mind, your will, and emotions. No matter what anyone says you can’t just snap out of anxiety, it does take a lot of work, and perseverance. You are battling your mind after all. Tackle it one day at a time. If you are having anxiety know that I am here and I will support you. It’s ok to not be ok…But not for long. I am convinced, now more than ever, that my childhood prepared me for this battle of illnesses that, simply put, is trying to kill me physically as well as mentally. I have struggled with so many illnesses in the last three years, every time I go to the doctor it seems there is just more diagnosed illnesses on top of what I already have. It should be overwhelming for me and perhaps I should be sitting in a corner sucking my thumb, rocking back and forth, but I am actually at peace. I want to share how I am able to handle and process these things that have been happening to me. We all have feelings and that’s a really good thing because that enables us to love others and respect each other but our feelings can also be a very damaging thing as well. For me my feelings either control my situation or I control my feelings and overcome my circumstances. It is ok to feel worried or scared, but I have found that in order to control my feelings about bad news I have to consciously tell myself how long I am going to have negative feelings. I literally have to stop and think about how I feel about each situation. I cannot group all of my issues together as one big problem, that would be too much, I have to look at things in a smaller scale. I choose not to worry. I choose to keep in mind the some of my situations are overwhelming, but I also search for the best outcome. I try and stay in control of my feelings. 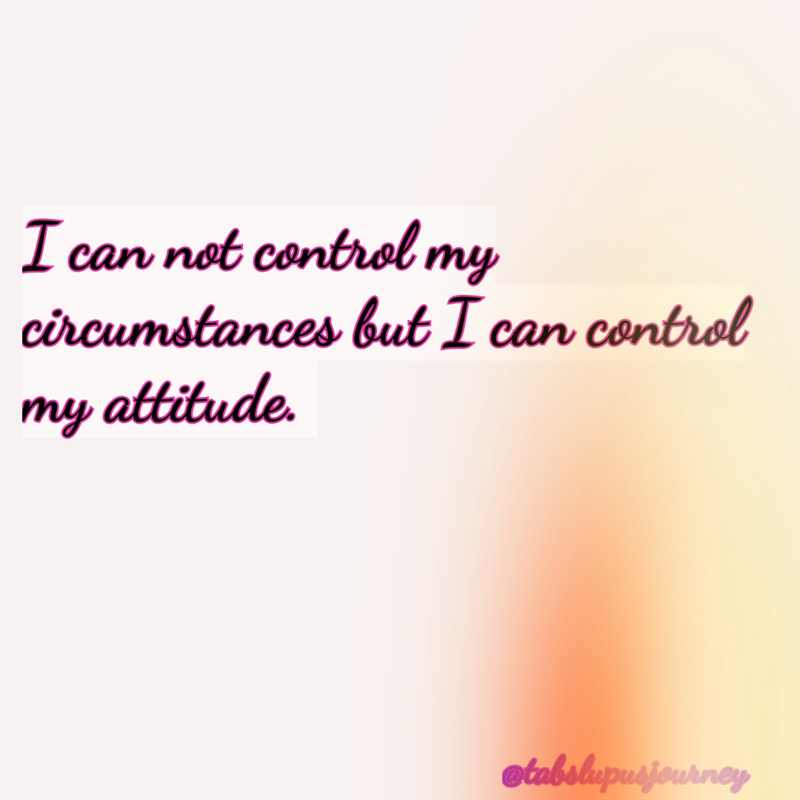 I have had to face many circumstances that have been out of my control. I have had to accept that’s it is ok to feel down and confused at times but only for a short period. I have to be responsible to bring myself back out of negativity and control my feelings about the circumstance that come my way. It’s ok to not be ok, as long as I don’t stay there for long. Being content is not being passive but it is about being comfortable with who God made you as a person. We can all look at ourselves and think, “I could have done better,” and allow that to motivate us to be a better person, that is a great motivation to action idea. To be comfortable with who God made us, is not an excuse to do nothing, it is saying, “I have been created for a reason, even in the situation that I was born,” God has a plan. It is never too late to fulfill God’s plan for our life. God does not make mistakes and we were not a mistake in any way, God has a reason for our existence, it is up to us to find that reason and do the best we can for Him.